If you’ve previously created a Harmony account for your device(s) but have forgotten the password you can reset it using the steps below. Looking to change your user name/email address? You must reset your password using the same software used to first create your MyHarmony account. 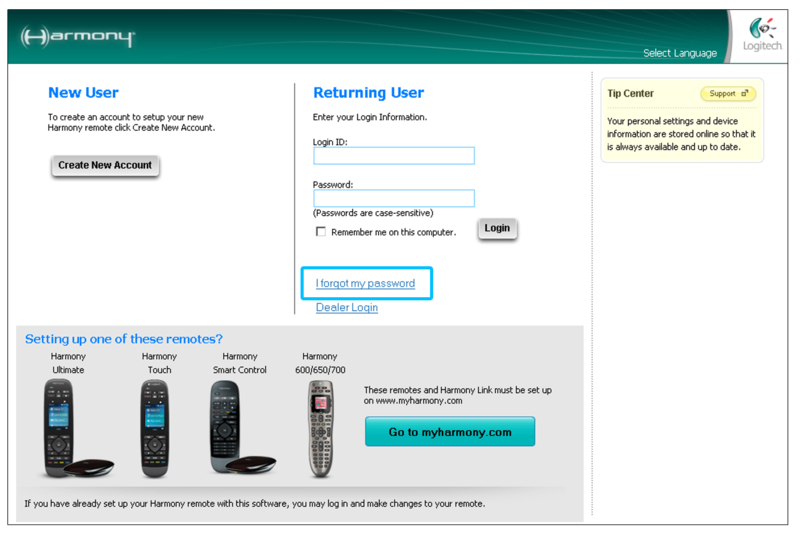 If you set up your remote using the MyHarmony.com website, please now use the MyHarmony desktop software to recover your password and make further updates to your Harmony remote. If you're unsure of which software was used to set up your remote, please visit our Harmony software downloads page to identify your remote and most likely software. 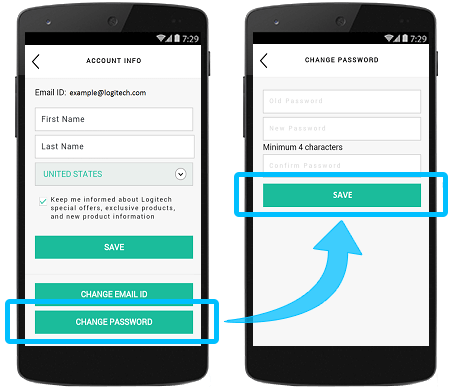 The Harmony mobile app allows you to recover a forgotten password during the new Harmony setup process. When the Harmony app prompts for your login credentials, select FORGOT PASSWORD? Enter the email address used to set up your Harmony remote. An email will be sent to this address with instructions to reset your password. Is your Harmony hub already set up and you want to recover your password? You can initiate a new Harmony setup workflow to recover your password. Are you already connected to your hub? Then select MENU and SWITCH HUBS. Select BEGIN SETUP > CONTINUE. Follow the on screen instructions to re-pair with your Harmony hub. When prompted to either CONTINUE with the existing configuration or SETUP a new remote, select SETUP. You may then follow the FORGOT PASSWORD? flow to send a recovery email. If you already have access to your account and would like to update your Harmony password, follow these steps. Using the Harmony mobile app, press the MENU icon in the upper left corner. 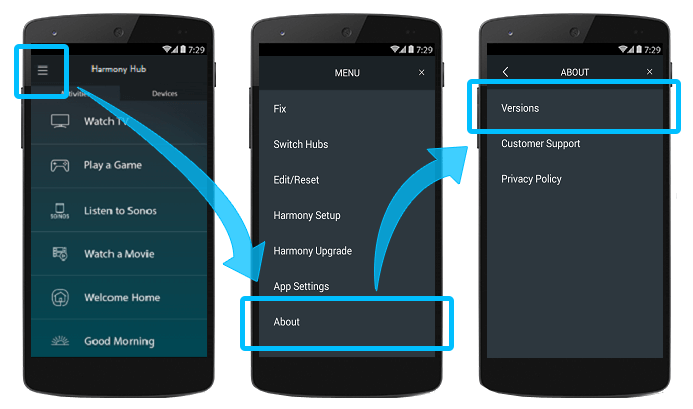 Select HARMONY SETUP > ADD/EDIT DEVICES & ACTIVITIES > ACCOUNT INFO. Select CHANGE PASSWORD and enter a new password. You'll be prompted to login again in order to authenticate your request. Launch the MyHarmony desktop software from your computer. Don't have the software installed? Visit our Harmony software download page. On the sign-in screen, select Forgot your password? Don't remember your username? Some Harmony remotes allow you to view it. Learn more. 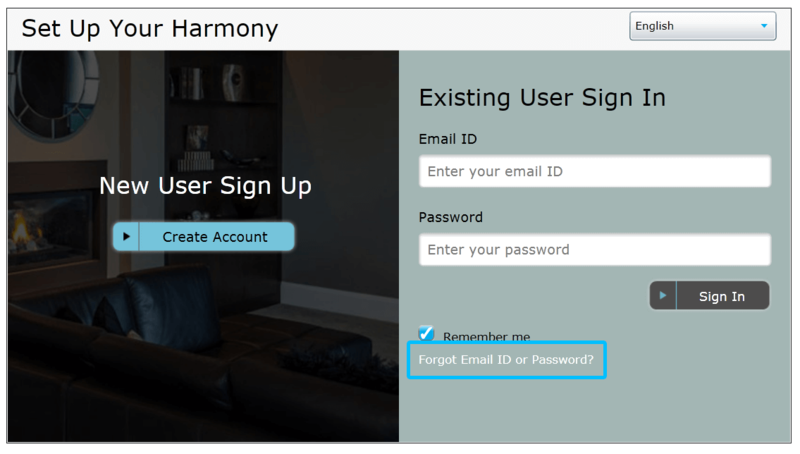 Launch and sign into the MyHarmony desktop software. Select My account in the upper right corner of the software. Harmony Ultimate Home, Ultimate One, Ultimate and Touch remotes allow you to view your account username. Press the MENU icon in the lower right corner of your remote screen. Select SETTINGS > GENERAL > ACCOUNT. The username used to set up this remote will be displayed. If you use the Harmony mobile app, you may view your username if you are currently logged into your account. From within the Harmony app, connect to your Harmony hub. Select the MENU icon in the upper left corner. The username used to control this hub will be displayed. Other remotes such as the Harmony 650 or Harmony One do not display the username used to set it up. 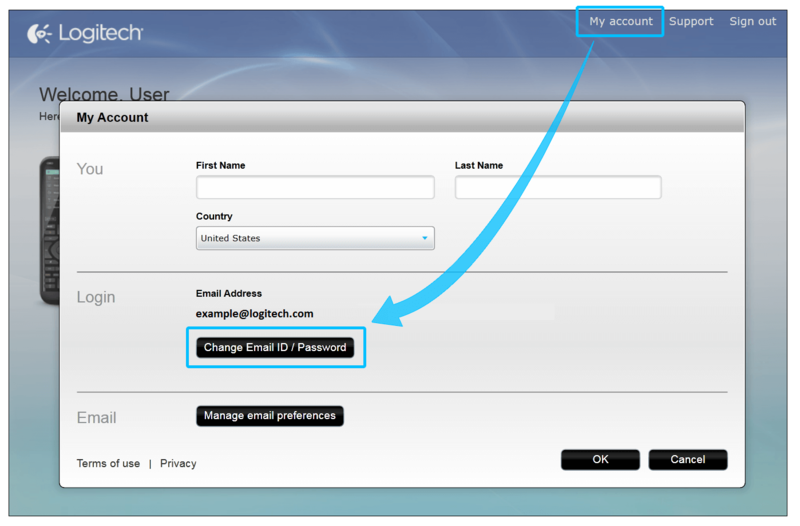 Account created using MyHarmony.com, the MyHarmony desktop software, or the Harmony mobile app use an email address as your log in name. The Logitech Harmony Remote Software v7.x uses either an email address or another user name. The Logitech Harmony remote software allows you to either connect your Harmony remote to your computer using it as a means to authenticate and access your account, or to recover with secret questions you answered during account creation. Launch the Logitech Harmomy remote software v7.x from your computer. On the sign-in screen, select I forgot my password. Select Yes, and then Next >. Connect your Harmony remote to your computer using the supplied USB cable. Follow the on-screen instructions to set a new password. Select No, and then Next >. Launch the Harmony Express app. If you're logged in, you will first need to log out. Tap Returning user, followed by Log in with email. Next, tap Forgot Password? and enter your login ID. This should be the email address you use for your Amazon account. You will receive an email with addtional steps to complete the process.